It was an event in the “Holy Fig Tree Room”. Riz Milton asked this in a stiff voice. She clasped her hands tightly in front of her abdomen so as not to lose to the terror gnawing at her heart. John Smith answered without hesitation. This entry was posted in Light Novels, Miss Appraiser and Gallery Demon and tagged Tamaki Itomori, Vol.2. The usual warning applies to not look at this unless you want your mental image irrevocably changed about some characters LOL although Riz and John look just like they do in the cover. I can’t tell if this was a shorter book than Light Beyond or what, but considering I seem to have zoomed through the first volume in just three months… I guess so?? Haha, anyway, please enjoy the afterword. It was a night full of stars, as if a silver fish was swimming. Riz came to a place called “Dawn’s Hill” together with John. This place was outside the royal capital in the eastern district. It was called that because the sunrise colored the entire gentle swell of the hill with light. It was also called the Lovers’ Hill because people could enjoy an entire night sky of stars. Riz and John weren’t lovers and it was more correct to call their relationship a master and servant, but— this was a secret time that wouldn’t be written down in the diary she touched every evening. The next day a letter of polite apology arrived from Emil. Riz immediately replied with the following contents: that she didn’t mind and he didn’t need to apologize and that she’d like to go and see the painting of the holy mother they spoke about before. Emil didn’t seem enthusiastic, but he appeared to feel guilt for involving Riz in his own love affairs. And so there was a reply that if she still wished to then she could come five days later. It had been a week since she began going to and from the art gallery. On the first day, when Riz had collapsed, John seemed to understand something and became a very naggy demon. The run-down carriage used for picking her up and dropping her off also changed overnight. Its outward appearance was still old, but its insides were brand new; there were plentiful cushions and it was even equipped with a blanket. Tonics were also present. John’s attendant act didn’t stop with just that. From the carriage to the mansion or the short distance to the art gallery, she was lifted up and carried the entire way. There was no sweet atmosphere at all; it was all done indifferently, as if it were obligatory. Riz felt like dying the moment Virma saw her like that. Several days passed without anything in particular happening. During that time, Riz came down with a fever, was restless, received visits from Hine, and other small events happened; however, she didn’t have any dreams of John anymore. When she asked Hine, he told her that John was diligently working at the art gallery. It was somewhat anticlimactic. Riz returned to her normal life after her body recovered. Time passed— it was her seventeenth birthday. And Riz was facing an unexpected situation. It all started a week before her birthday. She was urged by her mother, Virma, with “Here are five paintings. Now, choose the painting you love from these!” and, when she did just that, for some reason her fiancé was decided upon. Okay, now we’ve really reached the end of this long 2 year project. Thank you to everyone who supported this series or dropped by to read it. 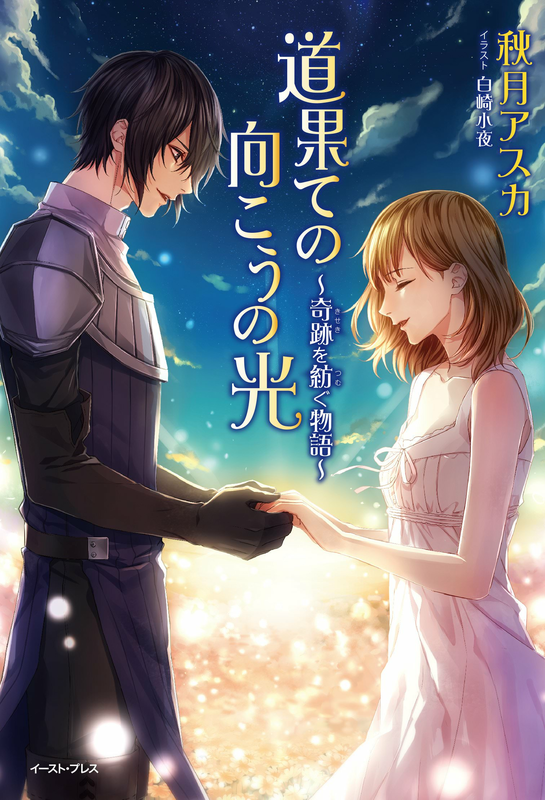 I’m going to take a long break after this and maybe play some otome games LOL but honestly this is still one of my favorite books and I’m glad I got to share it with everyone. Once again, please consider supporting the artist if you enjoyed this book and I only shared about 1/4 of the illustrations in total so!! At any rate, please enjoy the author’s comments down below. This entry was posted in Light Beyond Road's End, Light Novels and tagged Akidzuki Asuka, Vol.4. Character page! Once again, a warning not to look at these unless you want your mental image of the characters to be destroyed, haha. In a corner of the infirmary in the royal palace, Mislee and Nasha clapped their hands happily. Before their eyes was a fine, newly built medicine shelf. The shelf, which was at the height of the waist of a lady, was crowded with various small and large bottles that were lined up. Inside those bottles were many different kinds of medicinal herbs. There were various uses such as ones to be brewed or grounded and then coated on. Mislee placed both hands on her waist and gave a satisfied sigh. A voice that seemed to pierce the ears echoed in the room. Yuna heard that for certain. Several shouts rained down in a bundle. The door to the Hall of Blessings opened. A tranquil air filled the room inside. On the bed that was set up in front of the altar there were overflowing flower petals and a single girl. The goddesses drawn on the ceiling watched over the girl while dancing elegantly.